A paying guest seems like a win-win proposition to the Joshi family. He's ready with the rent, he's willing to lend a hand when he can and he's happy to listen to Mrs Joshi on the imminent collapse of our culture. But he's also a man of mystery. He has no last name. He has no family, no friends, no history and no plans for the future. The siblings Tanay and Anuja are smitten by him. He overturns their lives and when he vanishes, he breaks their hearts. Elegantly wrought and exquisitely spare, Cobalt Blue is a tale of rapturous love and fierce heartbreak told with tenderness and unsparing clarity. 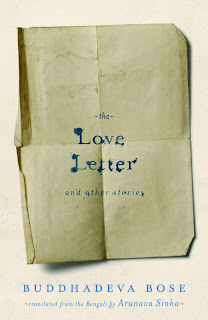 The Book Elf Says : If like me you also love handwritten letters then this one is for you! Saadat Hasan Manto's first collection of stories was published in the 1940s, but his stories have an enduring relevance. Now read by more people than ever before, the simple clarity of his stories about arginalized people, his astute understanding of the complexity of human nature and the poignancy of his stories on Partition transcend spatial and temporal boundaries many of his characters are legendary and his taut narratives are a great source of insight into the human condition. Widely regarded as one of the greatest short-story writers of the Subcontinent, Manto is now, a hundred years after his birth, also acknowledged as one of the most powerful voices of his time. An enigma in his lifetime, and plagued by financial troubles, alcoholism and legal persecution in the last years of his life, he draws a posthumous wave of near-universal admiration. 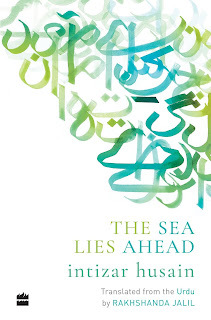 Aatish Taseer's sensitive translation captures the lyricism and power of Manto's voice. 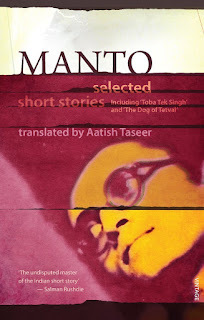 Manto, Selected Stories, with two new stories, is a collection to be savoured by new readers and old fans of Manto alike. The Book Elf says: Being a self confessed Manto fan, I love all his works. However, Toba Tek Singh is considered to be one of his best stories. Hence adding it to the list, hoping he makes you addicted to his work and you keep asking for more! In 1947, young Jawad Hassan gives up his ancestral home in India and his fiancee Maimuna for a dream country founded by Jinnah. And even though the newly created state of Pakistan is thronged by a huge number of zealous Muslims ready to lead from the front, the rapid breakdown of law and order in Karachi makes many, like Jawad, retreat into reminiscences of their past in undivided India. The second in Intizar Husain's acclaimed trilogy, The Sea Lies Ahead takes up the story of Pakistan where the first novel Basti (1979) ended: poised on the verge of breaking off from its eastern arm. This is a novel about those muhajirs, the author himself among them, who went to the promised Land of the Pure and were met with mistrust, prejudice and apathy. Equally, it is a rich portrait of the new culture of urban Pakistan fostered by people who came from the countless towns and hamlets in and around Lucknow, Meerut and Delhi. Bringing alive unforgettable characters with its sparkling prose, this novel is a powerful exploration of Islamic history and the story of Pakistan's great disillusionment. The Book Elf says : Such a beautiful story, it deserves to be felt and not just read! 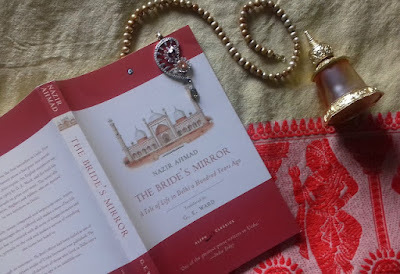 The bride’s mirror (mirat ul-‘arus) was the first bestseller in Urdu. First published in 1869, within twenty years it had gone into several editions and sold over 100, 000 copies. An English translation was published in England in 1903 by G. E. Ward and the book has been almost continuously in print ever since. The novel tells the story of two sisters, Asghari and Akbari, who are married to two brothers in Delhi. Akbari, the spoilt, mean-tempered and impetuous sister, fritters away all the advantages she is offered and makes a mess of her life. Asghari, who has to contend with all sorts of disappointments and setbacks, prevails in the end and makes a success of everything she turns her hand to. All through its existence, the bride’s mirror had been hailed as one of the most important works of Urdu literature ever published. The portrait it provides of the lives of those who lived in Delhi over a hundred years ago is an indelible one. The Book Elf says: I loved the depiction of women of the 19th century in the story. It was fascinating to read about their lives and struggles centuries ago in a country where women even today are struggling for some of the basic rights to existence. This story of two sisters living in Delhi was like a kaleidoscope for me as it made me see Delhi in a new light. 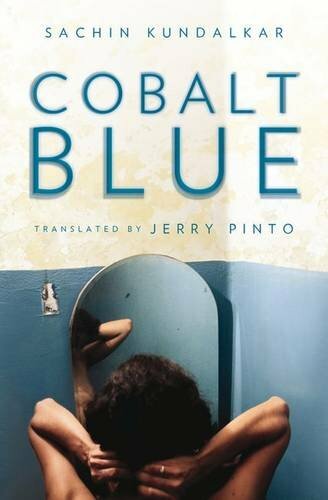 The language, the descriptions and the narrative though translated is lucid and poetic. It was an enthralling read as I basked in the beauty of history and the magic of Delhi. One of those many occasions when I felt I should know how to read Urdu to enjoy the beauty once again in it's original form. The characters were as endearing as they would have been at the time when this book was written. Though the ending is something many would have felt as abrupt, but if read properly it tells us a lot without being explicitly mentioned therein. Needless to add, this list is exhaustive and I will keep sharing my favorites with you time and again. 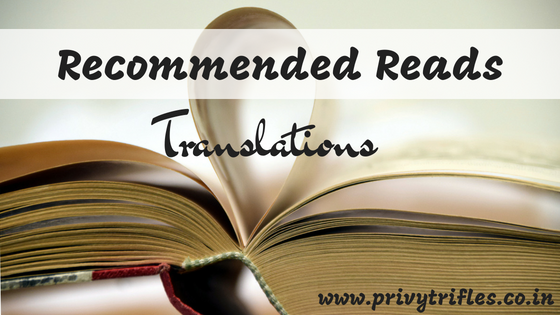 Till then, let me know in comments how many of these have you read and which are your top 3 favorite translations.